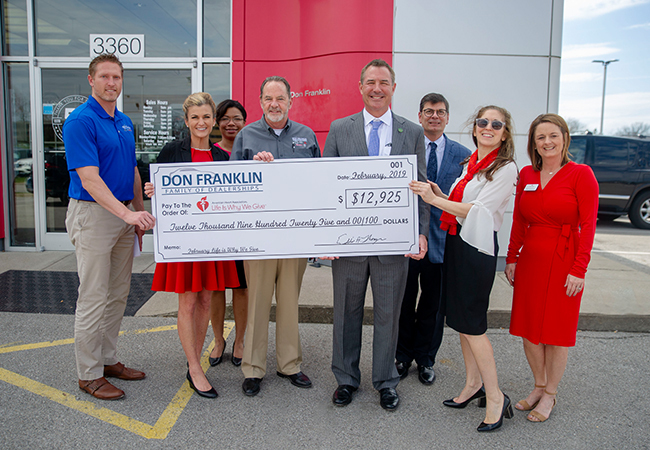 Don Franklin Family of Dealerships helps put an end to heart disease and stroke by raising funds for the American Heart Association. 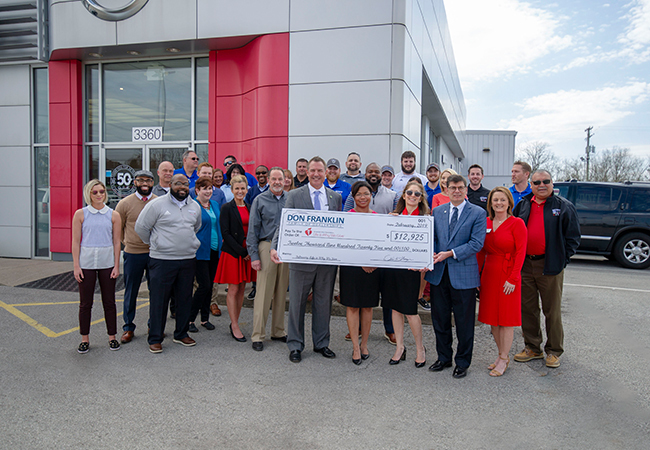 LEXINGTON, KY April 11, 2019 — Don Franklin Family of Dealerships has joined the fight against heart disease and stroke by supporting the American Heart Association (AHA), theworld’s leading voluntary organization focused on heart and brain health. During American Heart Month (February) Don Franklin Family of Dealerships participated in the AHA’sfundraising campaign, Life Is Why We GiveTM. The company donated $25 for every new vehicle purchase during the month, raising a total of $12,925. "We are honored and humbled to be able to donate to a wonderful organization that provides lifesaving research and hope for individuals in our communities,” said Eddie Franklin. “We are so grateful to our customers for allowing us the opportunity to do so". Don Franklin’s donation will go to support both the Central Kentucky Heart Walk on May 11 at Keeneland and the Lake Cumberland Area Heart Walk on September 12 in Somerset. In addition to contributing to save lives through Don Franklin Family of Dealerships, donations can also be made directly to the American Heart Association atwww.heart.org/lifeiswhywegive. To learn more about the Life Is Why We GiveTM campaignand other participating companies, please visit www.heart.org/lifeiswhywegive. From our humble beginnings in 1968 to now being the largest dealer group in Kentucky, Don Franklin Family of Dealerships works daily to provide our customers the best possibleexperience: finding the right vehicle for your family’s needs and budget- all with integrity, competitive pricing and a customer-first attitude. We adhere to our core values of being involved and part of our communities and putting “service above self”. We are honored to be able to serve charitable activities and causes. We all deserve to live a long, healthy and happy life. However, heart disease and stroke are robbing too many of us of this chance. The American Heart Association is working to ensure that everyone has an opportunity to have a quality of life that they can spend more joyfully with family and friends. When people donate or purchase goods and services from our Life is Why We Give cause supporters, we move closer to creating the quality of life we all desire. Life Is Why We Give aims to inspire consumers to think about their reasons to live healthier, longer lives and to give to AHA for those reasons. For too long, heart disease and stroke have stolenour precious moments. It’s time we fight back together and affirm that we’re more powerfulthan these diseases... because everyone has a reason to live a longer, healthier life... and that reason is why we give.